Take a gamble today in all that you do. It may not pay big dividends but at least it will be a day of fun and celebration. Watch you back. Not everyone has pure intentions at their heart. Caution now will insurer that trouble stays away today. News will open up the pathway for a much need change. A woman will be involved to provide financial assistance that will brighten and uplift the home. Gift: a gift of some kind has something to do with your future success or you will be successful in obtaining a gift you want to give someone or an offer made to your benefit. Letters: an important paper or hasty news about a change is coming soon from a long distance. Your Wish: if you have wished for work you will soon be employed or get something better in your line of endeavours. You should get your wish. Surprises: you will be surprised about an old persons wedding or when you hear of the marriage of someone whom you thought never would wed or some proposal will surprise you. Trouble: trouble is caused by friends. Be careful. Select good company or you will help a friend in need or friends will talk their troubles over with you. Seasons: something you desire very much will be given you this season or a present from an elderly person; a lasting gift will be received. Popularity: you will write something that makes you become popular or you receive a letter because you are popular, desiring your services. Journey: you will be successful in business also you may achieve success in publicity writing, something that goes into circulation. Enjoyment: you will inherit valuable things from a relative or very close friend who has your welfare at heart or a gift from a kindly person. Message: you will receive a message expressing gratitude or you will receive a message you are grateful for. Happiness: your future should be full of happiness either through achieving something or through a talent of your own. Happiness is in store for you. Compass/Thoughts: there is someone who will envy some good luck you will have. Remember good luck seems to follow only those who deserve it. Inquirer: sunshine and happiness for you after the rain. We must all have rain in our lives to balance the scales. Good times ahead. What can I learn about myself over this Easter holiday period? This Easter period will bring a flourish of new ideas and connections with liked minded people that are willing to grow and prosper. Allow the interactions to be balanced and realistic so as my expectations won’t be shaded in false promises. A bright, happy and cheerful attitude will result at the conclusion of this holiday period. Currently obstacles, expectations and attitudes from other people are wearing me down while I try to relax and take things easy during Easter. I am reminded that I need to be vigilant in my words, deed, thoughts and actions in dealing with outside influences so as to avoid misunderstanding, hardship and disappointment later on down the track. Old worn out ideas, associations and objects from the past that brought great pleasure and joy will leave me by the end of Easter. The success that I have taken for granted in the past is making way for new experiences and opportunities to emerge. These may not share the same beauty or durability of what I once had. Commitments and obligations that brought a feeling of unity and success have fallen into misery, suffering and unhappiness. This may have resulted by relying and trusting on others to supply me with resources that supported my past successes and happiness. Currently there is a need to do a lot of sweet talk to those that supported me in the past without being overbearing about it. Having a confident and willing attitude to take a risk in speaking the truth about my needs I can turn the hardships around into something pleasurable. By the end of the four day Easter period I will be well rested and optimistic to take on the challengers that have lingered around me for some time. Although there may be opposition and resistance in the beginning it will make way for a beautiful, strong and vibrant attitude in my future dealings with others. I am cautioned that excessive praise and charm will only create a high level of distrust and insecurity not only to my-self but to others as well in trying to obtain what I want. In being truthful I can avoid unnecessary trouble and unhappiness and achieve a far better result than previously thought possible. What advice do I need to know in finding love in 2016? Stop your self-judgement chatter and instead focus on developing giving your-self more love and compassion in order to achieve finding love in 2016. Allow your heart to be open to expanding and embracing the differences in potential suitors by not limiting your love options by what you see around you. Learning from the success and failures from past relationships provide the endurance and strength to find the love you are looking for in 2016. The blocks and limitations you have placed on yourself in the past have been removed. You are free to pursue your dreams. Make the time now to step out from your comfort zone. Use your creativity in stretching your resources in meeting and interacting with new people. Here is my attempt at working with Houses in a Grand Tableau spread. The past approach of channelling the feminine wisdom within me in seeking knowledge and ideas about attracting a romantic relationship has not worked. It has taken the harshness of disappointment and disillusionment in reaching this discovery and decision that another approach is needed. By taking full responsibility for my past actions I am in a better position to move forwards into oncoming opportunity and long term happiness. My current situation is alive and abundant with vibrant signs and symbols. Witnessing this provides me with the information that the wishing and hoping of a romantic relationship is going to be over soon. I need to maintain the feeling and experience of being in love and how that will express it’s self once I am in a relationship. The decision to relax and step out to meet and discover new people will bring a sense of creative fun and energy. The future outlook of being in a romantic relationship by June 2016 will be marred by the energy of dishonesty and deception by the people that I meet. It could be that the signs and symbols that I have interpreted as positive and uplifting information are in fact incorrect. An attempt will be made in trying to rectify and adjust my thinking and work with compromise instead only to be deceived yet again. I am reminded that I need to quickly pick myself up and move on so as I don’t get caught up in loss of hope and personal insecurity that I am not worthy of experiencing love and happiness. A Spade in Position 2 (Realization of Wishes) means that there is very little chance you will be successful in your project because of the deceit of others. The Queen of Spades in this position shows an unsociable and jealous woman. A Heart in Position 3 (Possibilities of Success) means total success in my project. The Ten of Hearts signifies good luck and contentment and tends to alleviate adverse indications. A Heart in Position 4 (Fulfilment of Hopes) means that my hopes will be realized. The Jack of Hearts represents a happy-go-lucky young man who has a pleasant, cheerful disposition but one who does not possess deep emotions or loft ambitions. A Club in Position 5 (Risks regarding Projects) indicates that time and effort I devote to the project are worth my while. Anyone connected with it will be congenial and dependable. The Ace of Clubs indicates that my life and affairs are well organised. My hopes and wishes are realistic; through energy and perseverance I will be able to see them come true. This card assures me of loyal and helpful friends throughout my lifetime. Many benefits are bound to come my way. A Club in Position 6 (Hearts Desires) means that I will realize partial gratification after some delay. The Seven of Clubs mean that a young girl will have great devotion; her interest in a person is so tremendous that she will make every sacrifice in his or her behalf. A Spade in Position 9 (Important Business Associates) can be certain that current business relationships will not be profitable to you but they may to others. 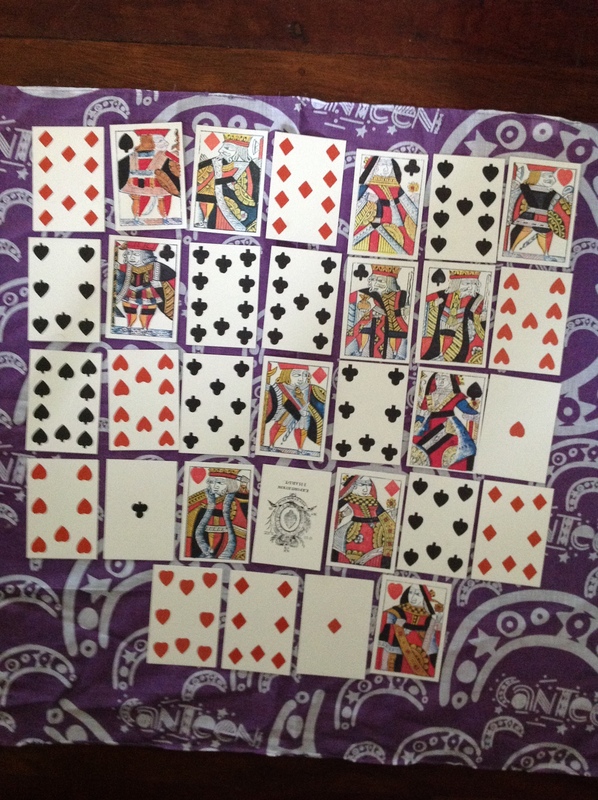 The Eight of Spades means opposition. A Heart in Position 11 (Troubles) means that I will suffer in emotional matters. The Nine of Hearts means that whatever is wished in connection with the position on which it lands will be fulfilled. I can expect that someone who has made me a promise will carry through with it in the very near future. A Spade in Position 12 (Condition of Life) means that I will not find that my status will improve with time as a matter of fact it will get worse no matter what I do to prevent this condition. The Jack of Spades means a man who is crude in every way. This adverse trait can only be modified if excellent cards are found around it in the spread. A Club in Position 14 (Love) means that I can count on the complete loyalty of loved ones and friends. The Nine of Clubs means that I will receive a inexpensive gift. A Diamond in Position 15 (Prosperity) means that I must realize that others envy will threaten my economic well-being. The Eight of Diamonds signifies a satisfactory business trip. A Club in Position 16 (Marriage) if eligible enter into a marriage for practical and monetary reasons. The union will be a suitable one. 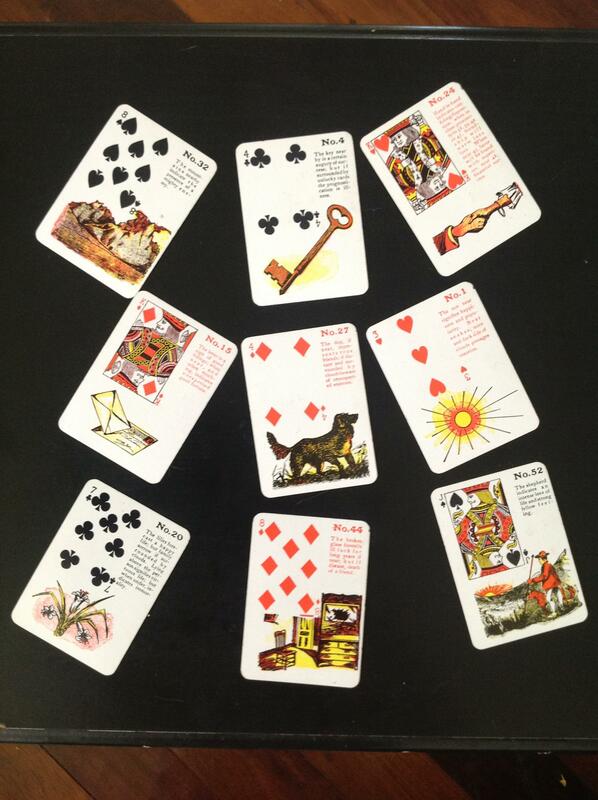 The Jack of Clubs is a genuine and enduring friendship with a male. A Heart in Position 18 (Enjoyment) can look forwards to happiness in a close relationship with another. Your efforts will be appreciated. Problems will be solved and will not destroy the association. 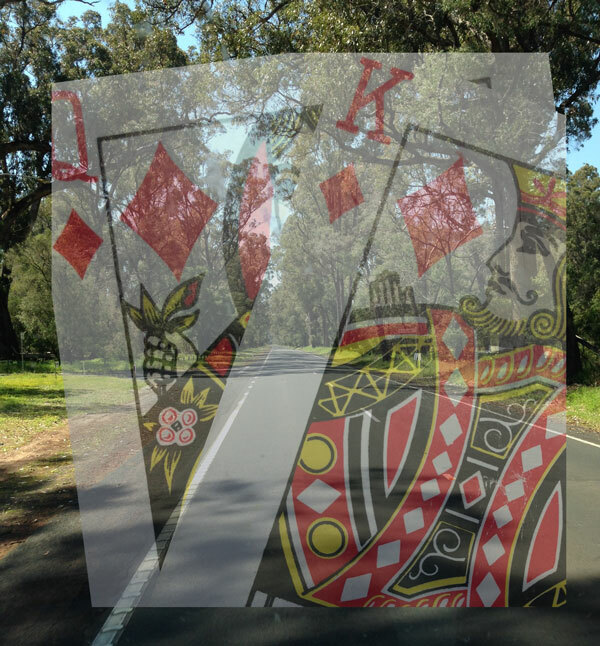 The Ace of Hearts means my home. A Spade in Position 21 (Competitors) can expect your rivals to be victorious over you. They will do everything possible to dishonour you with the people in your intimate circle. 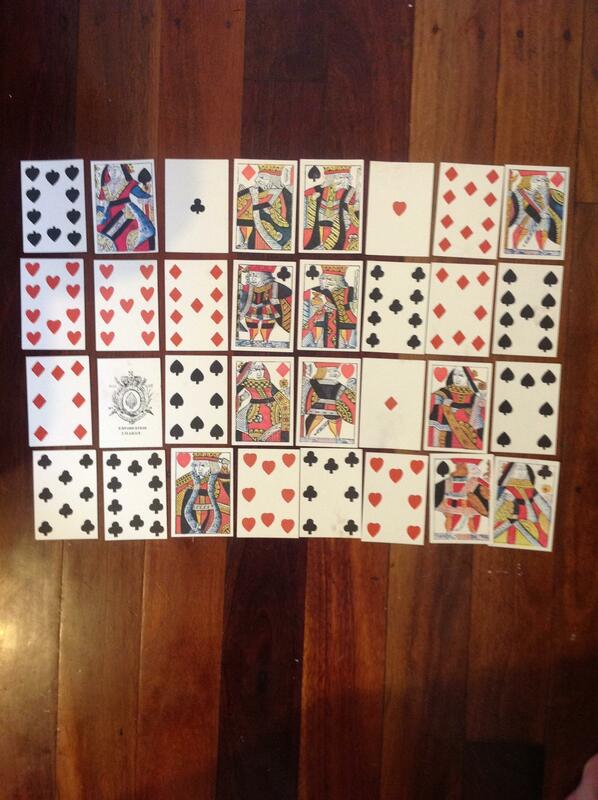 Two of Spades denotes a change in the base of operation or location of the home. A Spade in Position 24 (Fame or Notoriety) you will have so many obstacles in your way that you cannot hope to become famous. Your foes will do everything possible to destroy your standing in the world. The King of Spades indicates you must be aware of the fact that you have a rival. A Heart in Position 25 (Assistance or A Good Turn) may be assured of unlimited aid or friends will do something unexpected in your behalf. 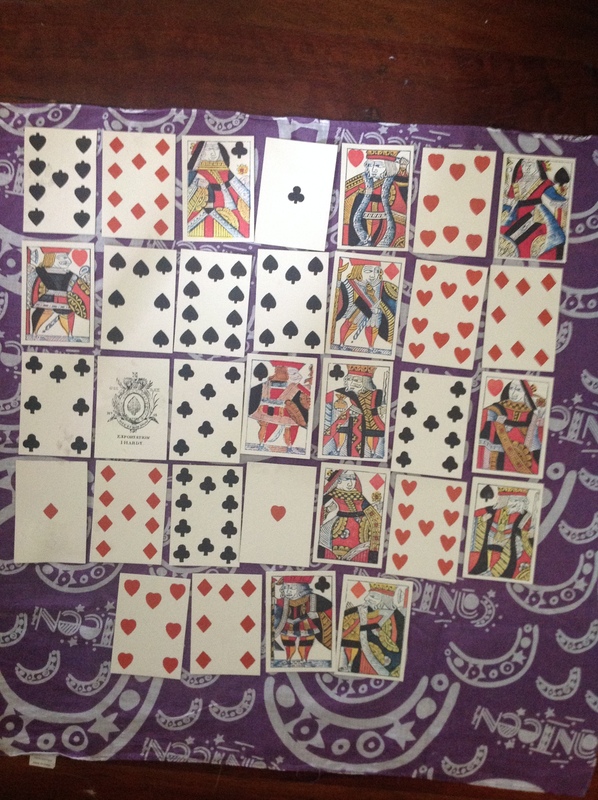 Seven of Hearts indicates whether or not favours requested in connection with the cards which surround it will be granted. A Club in Position 26 (Enterprise or Undertaking) will enjoy financial success as a result of friendly advice and assistance. The Ten of Clubs is an omen of good luck. A Club in Position 29 (Rewards and Appreciation) indicates a suitable reward but you must earn it through industriousness and perseverance. The King of Clubs is a man whose comradeship is of utmost value to you. A Diamond in Position 30 (Misfortune and Dishonour) will find that envy causes unpleasant notoriety and affects you in a roundabout way. This card is the harbinger of news which is coloured by the position on which it falls in the spread. A Heart in Position 31 (Luck) can count on unexpected good luck. The Queen of Hearts represents a woman who is kind hearted, magnanimous and dependable. A Diamond in Position 32 (Money) will tend to place your confidence in worthless friends and this in turn will bring losses. The Jack of Diamond has no special significance. A Diamond in Position 36 (Sickness) will suffer a critical illness but you will recover. The Seven of Diamonds is considered to be the harbinger of harsh criticism. It is also the signature of a young foreign girl. Health: something in the newspaper will make you heartsick or someone’s illness makes you blue or you may sign a will as witness or you will visit a dentist or doctor. Happiness: you will bring happiness into someone’s life and that person will be very grateful or by your being grateful for small things, you will obtain much happiness. Health: you will take a trip to visit a sick friend or you will take a trip for your health or a new baby in the family or worry over a change. 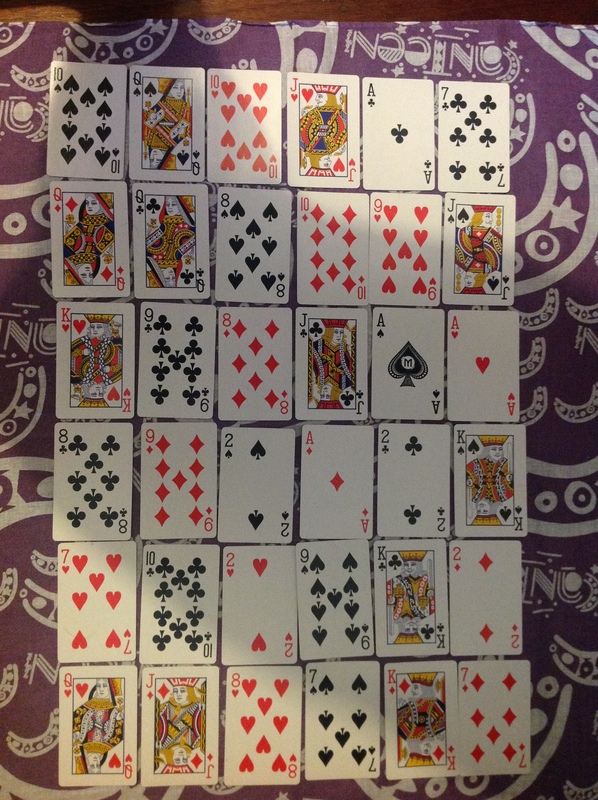 In a normal Grand Tableau spread the first thing is to look where the significator cards has fallen in the layout. In the Gong Hee Fot Choy system both male and female are represented by the Queen of Clubs. In my reading today, I am sitting in the House of Journey. There is an indication that within the month I am going to be experiencing a change of some kind that will involve moving or travelling. 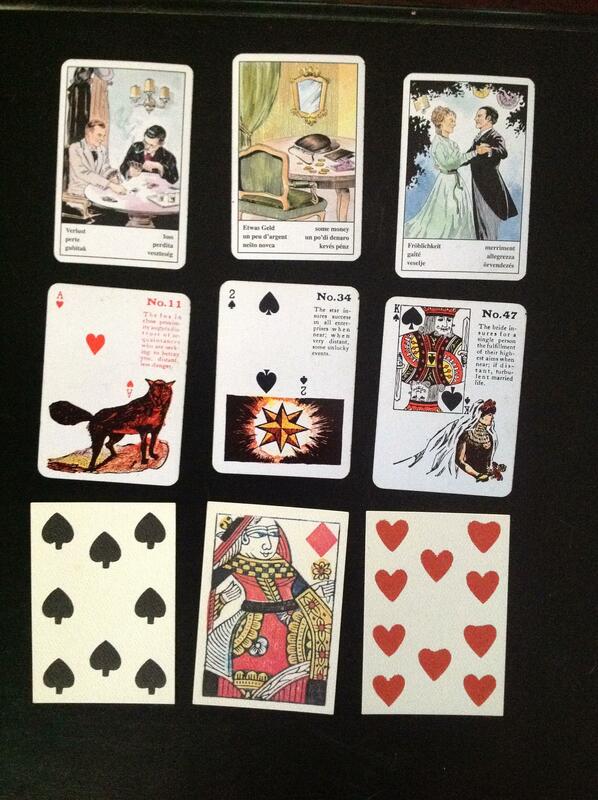 The card to left is the King of Hearts. This card is sitting in the House of Paper. The indication here is that I will be asked to store important documents. Above me lies the Jack of Clubs. This card sits in the House of Compass. This card has a number of meanings. It could indicate that within the month one of my relatives or friends will talk to me about radio work. It could also indicate a special message will come to me. Something that I hear involving my job or a job needs prompt action on my part. Below me sits the Eight of Hearts in the House of Relatives. The message is not a prediction but more a statement that some or one of my relatives loves me very much and that I am their favourite. This also applies to friends as well. Diagonally top left sits the King of Clubs in the House of Wishes. Its meaning is that my wish that I made while shuffling the cards will be influenced in a positive way by my vocation or job that I am currently doing or will in the future be doing. 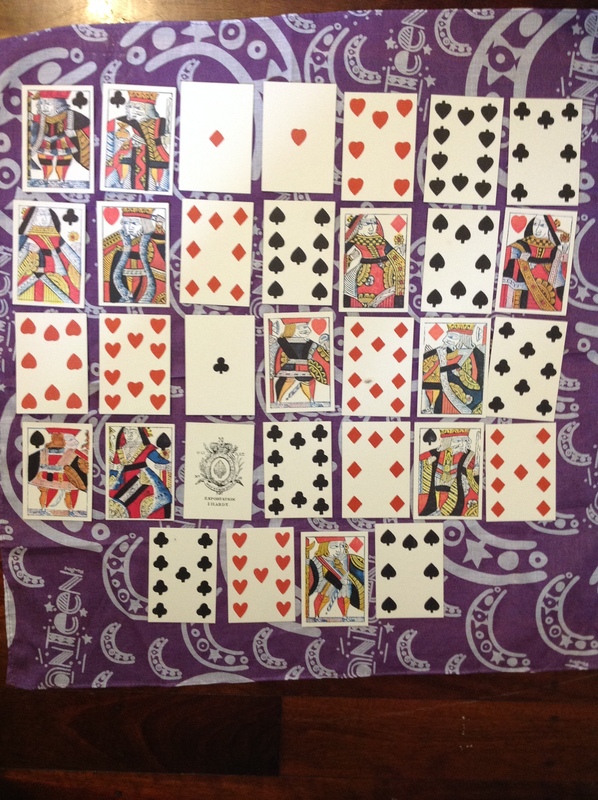 Diagonally bottom left sits the Ten of Hearts. This is in the House of Health. The prediction here means that I will hear of a wedding that makes me sick at heart or there will be a uniting of something in my community that will be for the betterment of the public’s health. It will be interesting to review this reading at the end of the 23 February 2016 to see what transpired. Vocation/Working Person: your wish pertains to or will be influenced by a vocation or job. Check the House of Vocation. Here a Club sits in this spot. This means that there is a good change of my wish coming true. Marriage/Union: you will hear of a wedding that makes you sick at heart or there will be a uniting of something in your community that will be for the betterment of the public’s health. This adaption of the Gypsy Cards has started to call out to me to learn. 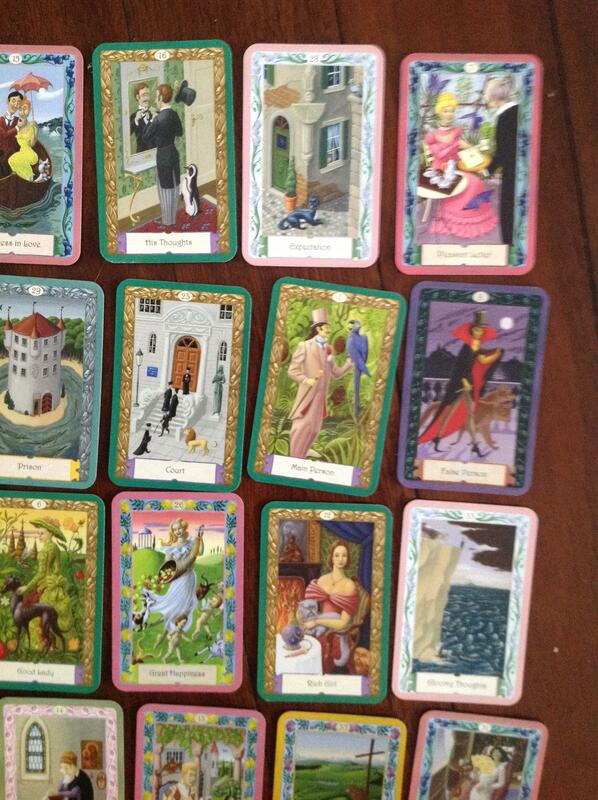 Here is a practice reading following the booklet that came with the original Whitman Gypsy Cards. My wish won’t get answered but I will be supported by loving friendships. There is no up/down meaning for ring as there is for whether the ring is right/left. I assume that instead of marriage, I will meet someone new and together our friendship base will grow even though some may not be troublesome. Actions taken by a close friend are likely to stir up further ongoing issues with a troublesome person. It will get resolved successfully although minor worries will linger. Good luck will come to me slowly although I will go through serious problems. It could be caused by a woman coming into my life. Happiness and good luck will return although it may cause a few minor family problems in the process. I won’t get my wish because of the actions of someone that I believe to be a friend. Change will come slowly which in some way is good as I am warned not to get ahead of myself to quickly. I will start to develop lasting and good friends although there will be one person in the group that is likely to cause problems. These problems may linger for quite some time but will eventually go away and bring me financial riches from what I have learnt along the way. Someone new will come into my life. This person is female and with her will come lasting good luck. The idea of moving house or career advancement is far from my mind. My interest is in growing and developing friendships. This brings me great happiness although some of these new friends will disappoint me along the track. The weeding out of these people will show me the ones that are true and sincere.